Seeing ebby's recent post in the Favourite Song of the Day thread got me thinking about Sin�ad O'Connor, and a search revealed a lack of a thread. So here one is! I'm not a Sin�ad expert by any means but what I have heard I love. So Far... 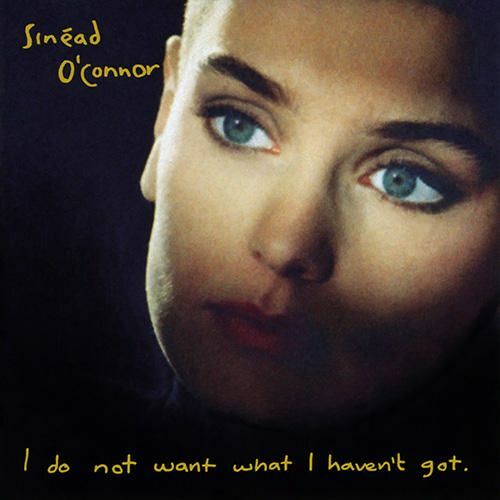 The Best of Sin�ad O'Connor was my entry point and then I got the two-disc remastered edition of I Do Not Want What I Haven't Got when it was released a couple of years ago. But I haven't really ventured into her other records yet (I did hear Throw Down Your Arms which I quite liked) and am planning to. Love i do not want!!!! One of my all time start to finish albums. Sinead is a tricky one... I feel she has had a tough time of it but some of the things she has done or said have just made it harder for people to take her seriously. Still she has bucket loads of talent as a singer and songwriter. Looking forward to hearing what direction she takes on Home. I've never seen her live and so am excited for the Manchester shows in the summer. I love everything she's done until Faith And Courage. FAC is her last good album for me; despite some really bad songs ("Dancing lessons" is total crap) I can play this record and have a good time. Everything she made after FAC is just unlistenable for me. Theology is... I don't know a word in English that can describe how much I dislike that album. But I will be eternally grateful for Universal Mother. Really the only album of hers that I love is The Lion and the Cobra. But, man, do I love it. Some of the most emotionally intense and beautiful songs created. Troy still blows my face off every time I listen to it. This makes me sad. It has a really wonderful melody. Faith And Courage is one of those albums that I enjoy musically quite a bit, although it's patchy, and I conveniently ignore the lyrics because she'd gone a bit too Jesus-y on it. I mean, I only fully realised recently that she was singing about being married to Jesus on "No Man's Woman". Lovely. But then you've got songs like "'Til I Whisper You Something", "Jealous" and "Daddy I'm Fine". It's a great little album and really won me over again. But, there's no doubt that she's one of the greatest female singers of the last 25 years. I'm a huge fan of her early work still, and there are still absolute gems to be found in her later albums too, but it's definitely not as strong. Watching videos of her singing Troy live with just a guitar way back in '88 shows just how strong that song is, and just how wonderfully original she was. Angry, bald, Irish woman with a huge voice and a "take no prisoners" attitude on stage. She was wild. It's easy to dismiss her now as being a crazy lady, or too controversial, or too religious, or whatever, but you really can't deny the huge impact she made when she emerged onto the music scene of the late 80's. I was introduced to her music properly through a best-of that was a birthday present when I was a teenager listening to Tori, Kate and their ilk. My brother thought I'd love Sin�ad, who I really only knew from "Nothing Compares 2 U" and "Mandinka" at that point. But there's such a strong back catalogue there too that you can't help but fall for her music. Last edited by ebby; 04-05-2011 at 11:46 AM. Ah, sinead... I Do Not Want is one of my desert island discs There is not one weak song on there, even though Nothing Compares has been played to death by the universe. Black boys on mopeds? Argh, perfection. Emperor's New Clothes? Great song to dance to while cooking. And I really like Faith and Courage. Sure, it's patchy but hey, so is Universal Mother which totally borders on being pretentious. Did ye all get "The Black Album"? I dunno how official it is or anything, but it's an 8 disc gathering of all kinds of rarities and collaborations. Some absolute gems on there, like her duet with Willie Nelson doing "Don't Give Up" (Peter Gabriel / Kate Bush cover) and all kinds of other oddities. Oh. I think it came out around the same time as that "collaborations" compilation. Some of the tracks are random live things, soundtrack recordings, collaborations - I'm not 100% sure just how official it is, but it's a great (but patchy) collection of rarities even if it is a bootleg. Last edited by ebby; 04-05-2011 at 12:29 PM. Dave Stewart, Sin�ad O'Connor, Kylie Minogue & Natalie Imbruglia doing "Love Is A Stranger" and "Sweet Dreams". Just finished listening to I Do Not Want What I Haven't Got for the first time in ages and forgot how beautiful a lot of it is. Her performance on "Black Boys on Mopeds" is exquisite. I remember being surprised when I first heard the album how many slow, quiet songs it has on it but they're all so lovely. And some of the lyrics also stood out - "I never said I was tough / that was everyone else / so you're a fool to attack me / for the image that you built yourself" on "You Cause As Much Sorrow," for one. Now I'm going to watch all these good videos which I've never seen before! I've been a huge fan since I was 13. I love just about everything she's done. Not a huge fan of Theology though. I've never seen her live. It's on my bucket list. Troy still kills me every time. Every time. I lost my virginity to In This Heart. I loved her recent reggae album. Probably would've been alot more fiery had she recorded it earlier in her career. Perfect. Cause the song rises to a crescendo/climax as well, dontchaknow!